You can use OneNote to collect and organise a wide range of content, whereas your paper notebook can really only cope with text, drawings and perhaps glued-in pictures. OneNote can go further, allowing you to clip content from websites, add audio notes and link to videos. Paper notebooks not only get bulky once you’re into several volumes but are also prone to loss and damage. OneNote notebooks are stored in the cloud (in your OneDrive) and automatically saved and synchronised, so you can access them on any web-enabled device. Not only can you read or edit your notes on the go, but you can work on notes at home then find them waiting for you when you log in on campus. OneNote uses a structure of notebooks, sections and notes so it is easy to create an organisation that works for you, but even with the best system there will be times when you cannot remember where you saved that really important quote. Instead of spending hours leafing through paper notes you can use the search function to find that elusive entry. Another really useful feature of OneNote is the ability to share notes or notebooks with other people. This could be great for collecting material for a group project. 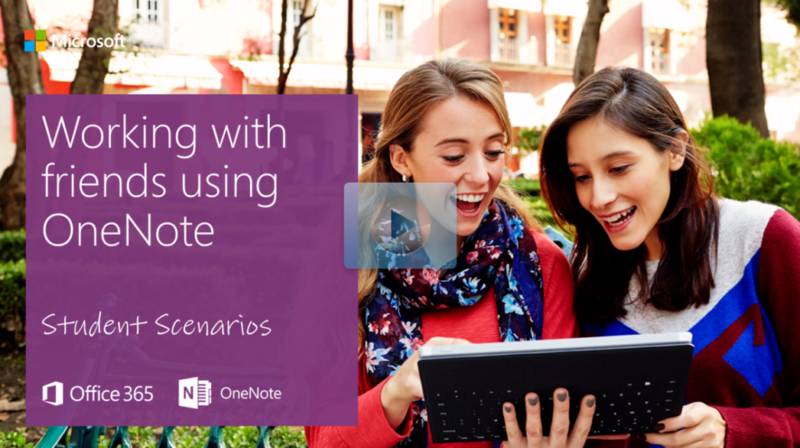 This interactive guide from Microsoft will take you through how to share with OneNote. How can students get started with OneNote? Head to the ITS webpages to install OneNote on your own computer (it’s already installed on the computers in cluster rooms). When you first open OneNote, a notebook is created for you. You can create new notebooks any time—and you can have as many notebooks as you want. Choose OneDrive – University of Sussex to create a notebook in OneDrive. If you choose ‘This PC’ your notebook will only be available on that machine, not your other devices. When the new notebook has been created, it will show up in your list of notebooks. Each new notebook contains one section which contains one blank page. How you organise your notebooks, sections and notes is up to you, but if you are starting to use OneNote as a student this is a simple structure that should get you started. First, create a notebook for each module. 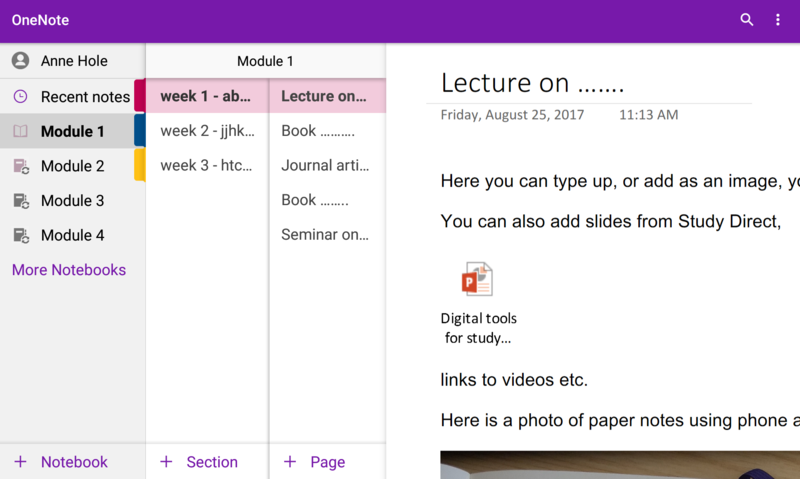 In each module notebook, create a section for each week or topic. In each weekly section add pages for your notes. These could be one note for each lecture, seminar reading etc. Where can I find out more about using OneNote? 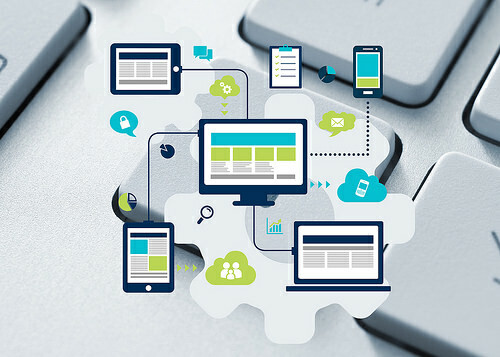 Staff and students at the University of Sussex can also learn more about ways to organise work in a faster and/or more flexible way using digital tools and services with an online course from Technology Enhanced Learning running from 6th to 10th November 2017. Take 5 Digital Productivity offers the opportunity to try out a range of options to help you organise and manage tasks, make notes, work in teams and collaborate online. Book for the course via Sussex Direct. 2 Pings/Trackbacks for "5 Great reasons for students to use OneNote"